You know how people go nuts for Milanos? I like a Milano as much as the next person, but I really love the Brussels cookies. The great news is, you can make them at home! I found this recipe on Two Peas & Their Pod. It's relatively easy, though you might freak out that the cookies are burning (they're probably not) and you might wish one batch turned out way more cookies than it does. But it's a fun, different sort of cookie recipe. If you're a fan of crispy cookies and that chocolate/oatmeal combo, these babies are for you. 1. Preheat oven to 375 degrees. Line two baking sheets with parchment paper. 2. In a medium bowl, combine flour, sugar, cinnamon, baking powder, salt, and oats. 3. In a large bowl, combine melted butter, cream, corn syrup, and vanilla. Use an electric mixer to mix until smooth. Slowly add the dry ingredients, mixing until just combined. 4. Onto the prepared baking sheets, drop about 3/4 teaspoonfuls of batter. Try to make all the cookies about the same size, and give them plenty of room as they spread out as they bake. 5. Bake for 8 to 10 minutes. Remove from oven and let cool for a couple minutes on the baking sheet. Carefully transfer the cookies to a wire rack to cool completely. *Note: The edges of my cookies looked dark, and I worried they were burnt — but they were perfectly fine! So if the edges really crisp up, don't panic. 6. Melt some dark chocolate in the microwave. Find two cookies that are about the same size. Spread one cookie with melted chocolate and place the other on top. Allow the chocolate to cool. I used quick oats instead of old fashioned and milk instead of cream because that's all we happened to have on hand. Even so, the cookies were wonderful! And I imagine they'd be even better with the proper ingredients. I got about 20 sandwich cookies out of this recipe, and I wish it had been more. Definitely double the recipe if you want to have enough to share with a crowd. They're also best eaten within a few days after baking; a week spent in tupperware and they lose their delightful crispy-crunch. Happy baking! Tis the season to eat your weight in cookies! I told myself I would be good this year — then I baked these angel sugar cookies, did them up Christmas style, and my plans were shot to smithereens! These are my favorite homemade sugar cookies, period. I dare you to show me a more tasty recipe. No really, I'd love to bake your favorite sugar cookie, so if you have a recipe you really believe in, share it! The world needs all the sugar cookies it can get these days. Here's what's so great about these sugar cookies: Number one, the texture. They just melt in your mouth! Number two, the sheer amount of cookies you can eke out of the batter — several dozen, if you make 'em small. Number three, they're easy to make: Mix up the dough, let it sit in the fridge for an hour or more, then you're off! Number four, you decorate them before you bake them, so all that's left to do once they're out of the oven is stuff your face full of cookies. 1. Preheat oven to 350 degrees. In a large mixing bowl, cream together eggs, oil, butter, sugars, and vanilla. Add remaining ingredients and mix well. Cover and refrigerate dough one hour. *Note: You can refrigerate for longer, you just might have to let the dough soften on the counter for a bit before you work with it again. 2. Onto an ungreased cookie sheet, drop balls of dough (you can use a cookie scoop, or I just used a teaspoon measure). On the bottom of a round, flat drinking glass, smear a dab of butter, then dip the glass in granulated sugar. Use the glass to slightly flatten the remaining balls of dough, dipping it in sugar for each cookie as you go. Sprinkle each with colored sanding sugar before you bake. 3. Bake for 6 to 8 minutes (depending how large), until the cookies are just barely (and I mean barely) turning brown. I set my timer for 3 minutes, turned the baking sheet around in the oven, then baked for another 3 minutes exactly. Allow to cool on the baking sheet for 10 minutes, then transfer to cooling rack. Be careful when storing these babies — they're wonderfully soft and breakable. When flattening the dough balls before baking, take care not to over-flatten. The cookies are more compact and cuter that way. Of course, it takes a little to get the hang of the perfect flat-ness. If any of the cookies turn out especially ugly, oh well! Guess you have to eat those on the spot to destroy any evidence. As for decorating, I think these cookies do best when you really pile on the sprinkles before baking. I used red, green, and rainbow sanding sugar, experimenting with the color placement. **Note: These cookies would NOT be good for frosting after baking. The texture is too light and crumbly, so over-handling them would probably mean curtains for your cookies. It was always going to be the ultimate mother-daughter weekend — what we didn't know is that the stars would align to turn "ultimate" into something even better: unforgettable. My mom and I planned a two-night stay at the Queen Anne Guest House (a bed & breakfast) in Galena, Illinois, over the town's most festive weekend of the year. Every December, Galena lights up with luminaria (small paper lanterns) for one night, and the town glows. Galena is set in a hillside along a river, so it's picturesque even without the extra dose of holiday cheer. Main Street really does look like one of those porcelain Christmas villages come to life. We arrived on Friday evening, joined the other guests in the parlor of the Queen Anne for some refreshments (people sure love to talk! ), then ventured out for some dinner. We settled on Fritz and Frites — a European bistro with a menu split between German and French food. It was heavenly. The ambience was wonderfully snug and set to the tune of Bing Crosby's crooning. Love. Then it was back to the Queen Anne to relax in our cozy little room. It really was a charming place to stay. We had an electric fireplace, a DVD player (good thing we packed Holiday Inn and White Christmas! ), and a coffee and tea tray just outside our room. There was also a fluffy cat named Princess who made an occasional appearance for a belly rub. The owners were super nice — though, I'm sorry to say, the didn't serve my favorite breakfasts. Nicely presented, and parts were scrumptious (that bruléed oatmeal! ), but overall... Just not my favorite. Still, certainly a nice place to stay. On Saturday, the day of the Luminaria, my mom and I bummed around town, taking in the shops. Some of the stores are absolutely lovely — and others are a strange mix of nice-enough and super-tacky. We didn't get much Christmas shopping done. But we did stop at Devour Café for hot chocolate, and this place is definitely worth a trip if you're in Galena. The ambience is part antique coziness, part rock n' roll. We were enjoying our cocoa, sitting on two velvet chairs in this old, tin-ceiling café, next to a Grateful Dead poster. Amazing. 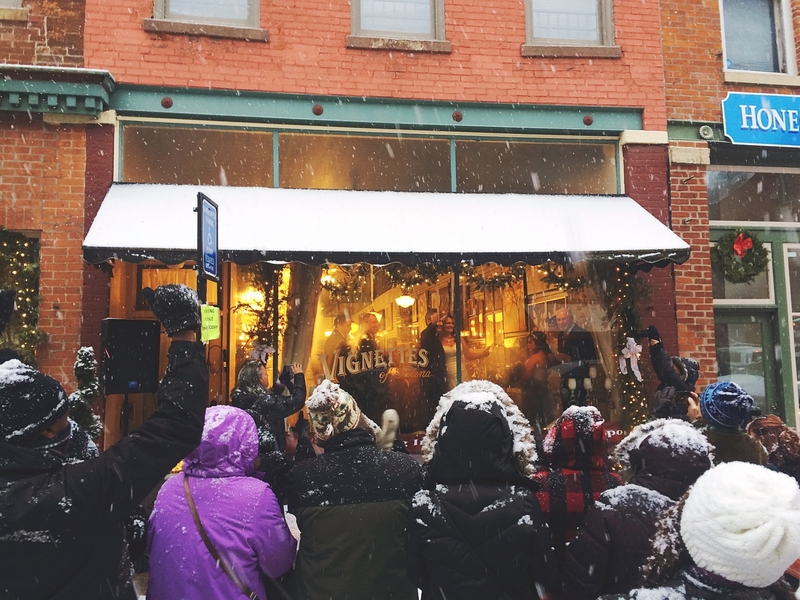 At 3:00 on Saturday afternoon, the festivities started on Main Street. First up, it's the Living Windows. That's where some of the shops set up living displays in their front windows — in one, there was even a wedding! As we walked toward the wedding window, it started to snow. It was the kind of snow that falls softly — no blustery wind, just that perfect snow globe feeling. Anyway, we watched a happy couple say "I do" in a window, the ceremony broadcast over a speaker system in the street. The crowd cheered, the couple kissed and waved — it was unreal! Like something you'd expect in Stars Hollow, not a real-life town. But it actually happened! For the other Living Windows, there were magicians, cute kids dressed as Santa's helpers and toy soldiers, artists at work, and a whole rock band streaming Christmas jams into the streets. Eventually Mom and I stopped for dinner at Fried Green Tomatoes — huge place, pretty tasty, great service. But after being spoiled by the ambiance at Fritz and Frites the night before, we decided that we'd probably try to find an alternate spot to dine if we come back next year. When it was finally dark enough for the luminaria to glow, we walked up hill and down, over bridges and across train tracks. All the while, we followed the luminaria through the snow-globe snow. We couldn't believe our eyes — or our luck. If ever there was a Christmas card scene, this was it. We eventually ended up back at Fritz and Frites for coffee and cake to cap off the evening. As we were finishing up our sweets, just two other tables occupied in the place, a troop of about a dozen carolers burst through the door. They sang "Joy to the World" and "Winter Wonderland" and "Angels We Have Heard on High" with clear, harmonious voices. Then they left as quickly as they arrived, to the tune of "We Wish you a Merry Christmas." Mom and I beamed and sighed. Unforgettable indeed. When you're blessed with talented friends in your inner circle, you have to boast about them from time to time. Today it's Erin Kelly of Erin Kelly Illustrations! I've known Erin since high school, at which time I was a secret admirer of her paintings at the yearly CMH art show. Over the years, I've seen Erin find her artistic niche — most notably, watercolor paintings of friends on their wedding day and watercolor quotes, like this one she framed for my birthday. Luckily for the gift givers of the world, Erin has recently opened an Etsy shop. Her virtual storefront is filled with ready-made prints of Christmas quotes. You can also contact her via her website to chat about custom pieces — perhaps a line from your favorite movie or prayer. Though the deadline has already passed to order custom projects in time for Christmas this year (sorry friends! ), it's something to keep in mind for birthdays & future holidays. Erin's watercolor wizardry doesn't stop with hand-lettered words. She's made quite a splash creating home paintings — all she needs is a photo of the house. And don't forget gifts for the bride and the occasional puppy portrait! What I love about Erin's attitude in her artsy business is that she's up to tackle anything within her talents — and that's heaps of talent! So if you have an idea, reach out to Erin; she's ready and waiting to work her magic for you. 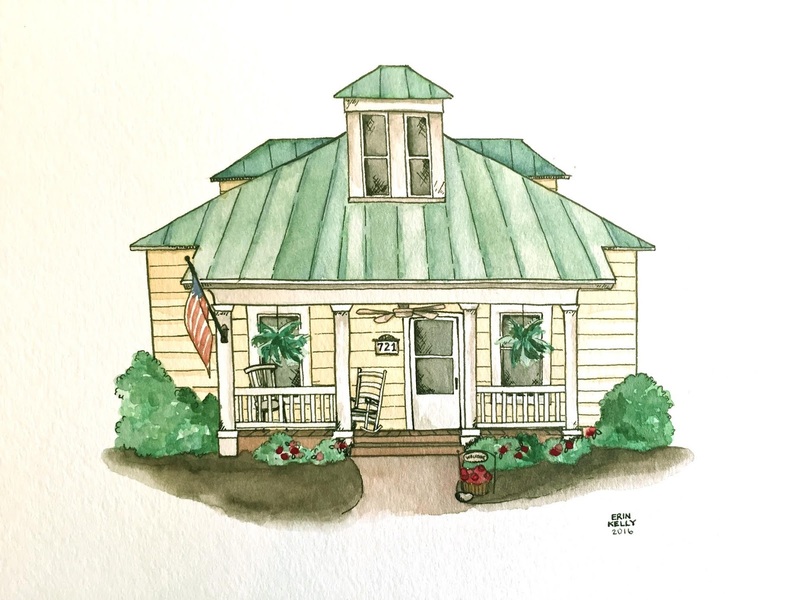 For more info, visit erinkellyillustrations.com. And for daily prettiness, follow Erin Kelly Illustrations on Instagram! A few weeks back, I shopped the wonderful Christkindlmarkt at the Best Place Pabst, where my friend Fritz and I chatted at length with the owner of Cream City Ribbon. He was a delight, but even if he hadn't been, we would have stocked up on his locally-made ribbon. Seeing as it's the holiday season, we can all use a little extra flourish when it comes time to wrap our many gifts — and Cream City Ribbon gets my vote and my business. Just check out these super fun patterns! The ribbon is actually 100% cotton, though it feels more like heavy craft paper with a bit of a wood grain texture to it. But it's super flexible — easily tied in a bow, of course! The point of the 100% cotton is that it's entirely biodegradable. The designs printed on the cotton are made with soy-based, non-toxic inks. You can even order custom ribbon if, say, you're looking to tie up goodies in your wedding colors. It's just a cool operation, and it's happening right here in Milwaukee! You can shop Cream City Ribbon online at creamcityribbon.com. Happy gifting! 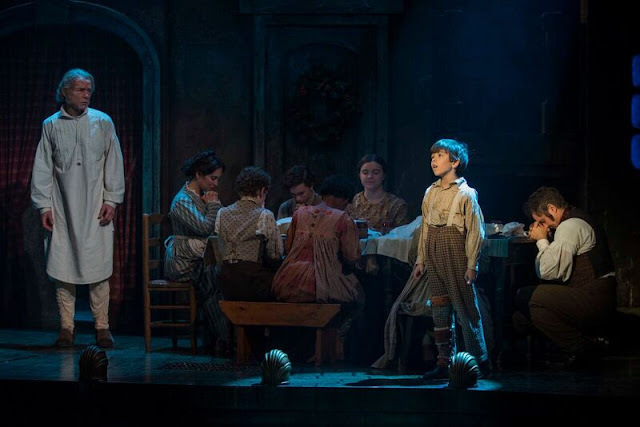 The Milwaukee Rep presents "A Christmas Carol"
I've seen so many movie versions of A Christmas Carol, the lines run verbatim through my head this time of year. Christmas a humbug uncle? You don't mean that! There's more of gravy than of grave about you! And so as Tiny Tim observed, "God bless us everyone!" It's turned me into a rather harsh critic of all new iterations of this wintry ghost story about three spirits thawing an old miser's heart. How can you top the choreography and art direction in the musical Scrooge, or Kermit as Bob Cratchit in The Muppet Christmas Carol? Well the Milwaukee Rep's brand new, 40+ anniversary production of A Christmas Carol puts its own mark on the Dickens classic. 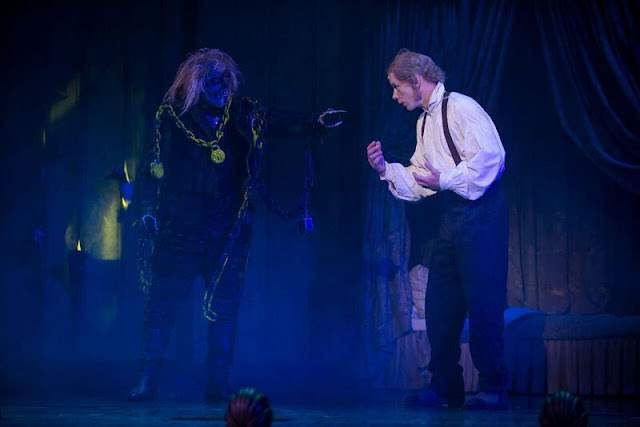 For starters, Rep Artistic Director Mark Clements embraced the ghostly elements of the story for a solid dose of spook factor. Then there's the staging, eliciting audible gasps and "wow"s from the audience. Even after leaving the theater, that's all anyone could talk about. The ambitious set (three years in the making!) features over 300 lights, 60 windows set aglow, and a massive turntable that rotates to reveal a new London scene at every spin. I have to say that, towering set design aside, my favorite creative choice by Clements is his dedication to making this a show for kids and families. Clements has said in interviews that he recognizes A Christmas Carol to be one of the first theatrical experiences that many children will have — and how right he is! The Christmas season is a time for getting dressed up in little suits and ties, patent leather shoes and velvet headbands. A time for special outings that offer an escape to another, more magical world. With the little ones in mind, Clements commits to giving them an unforgettable experience. The show is done in British Panto style, meaning there's lots of audience interaction. Scrooge asks us questions and we're meant to respond with a hearty "yes!" or "no!" or "look behind you!" I say "we" because of course the adults are expected to participate, too. Which leads me to a key point: To enjoy this Christmas Carol as a grown-up, you've got to suspend your disbelief and check any Scrooge-y tendencies at the door. Jump wholeheartedly into the game at play — no eye rolls, no heavy sighs. Do it for the kids. Because I promise you, even when you want to just sit quietly and let someone else shout "yes!" for once, the kids are loving every minute of it. So what else is new about this Rep production? The costumes are a mix of old and new. The Ghost of Christmas Past wins this round with her twinkling LED ensemble, and Deb Staples rocks the role with a commanding, Galadriel-esque presence. The Ghost of Christmas Present is in fact Jamaican, mon. I found his accent a little hard to understand at times, though his sunshiny vibe is unmistakeable. There's also new music by award-winning composer John Tanner, including a little solo song for Tiny Tim. And there's a new Scrooge in town: Jonathan Wainwright, who I think played the part marvelously. I imagine there's a lot of pressure in having to live up to such an iconic figure. Though funny and spirited at times, Wainwright's Scrooge moved me most in his quiet moments of observation — as he tenderly watches Tiny Tim sing his wishing song, and as he achingly longs for the love and joy of family while dropping in on his nephew Fred. Speaking of Fred, Michael Doherty practically stole the show for me. He plays Fred with such vigorous joy, it's easy to fall a little bit in love with him and his delightful exuberance for Christmastime. Other standouts for me include Christie Coran as Ellen (the character's heartfelt acceptance of Uncle Scrooge gets me every time, and Coran's portrayal was wonderfully warm), Jonathan Daly as Mr. Fezziwig (as jolly a Fezziwig as ever there was! ), and Angela Iannone as Mrs. Fezziwig. Inannone and Doherty also open the show as a narrating pair of barkers, schooling the audience in how Panto-style theater works — interactions and all. At the very end of A Christmas Carol, the moral of the story is put into action with a call for donations to the Boys & Girls Club of Greater Milwaukee. The actors shout that they'll be in the lobby, bearing empty top hats and bonnets for filling for donations. The sentiment behind such a call is certainly on point, but the interjection was a bit startling. I wasn't ready to be jolted back to reality just yet. Does this happen at every performance? Has it been happening for 40+ years? Maybe I just need to get with it! Regardless, the final moments of the Milwaukee Rep's A Christmas Carol went out with snow. Snow inside the already-dazzling Pabst Theater. Snow drifting down over the front orchestra section, as children leapt from their seats, chasing the flakes in the aisles, trying to catch just one. 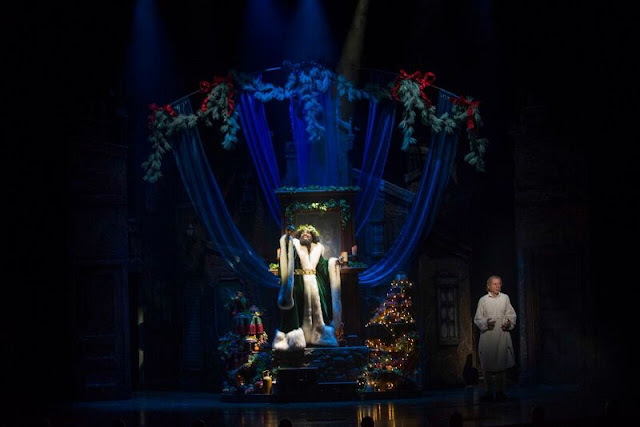 Mark Clements' vision of a kid-friendly, interactive, moving, eye-popping, and magical Christmas Carol was certainly worth the three years in the making. Cheers to the Milwaukee Rep and another 40+ years of A Christmas Carol. This is one theater company that knows how to keep Christmas well — may that truly be said of us and all of us. 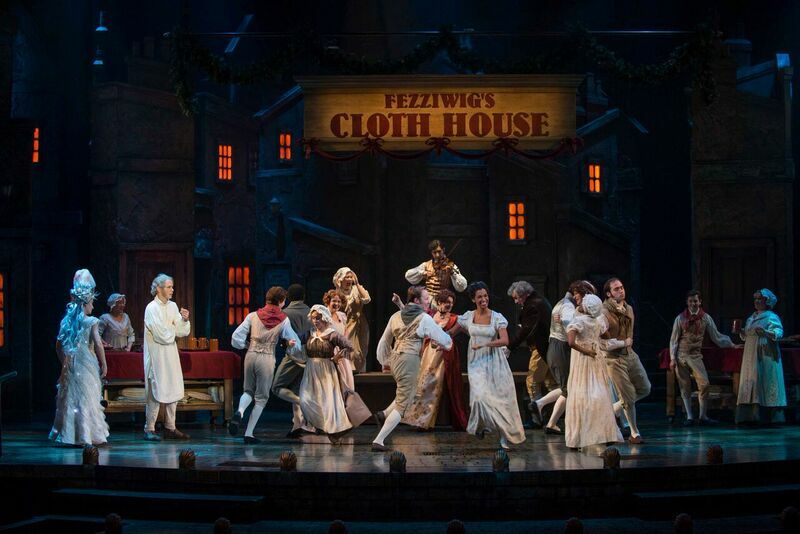 A Christmas Carol is playing at the Milwaukee Rep now through December 24th. Information and tickets at milwaukeerep.com. Exploring San Diego with friends. Oh, and shopping in San Diego. Repping Jahnke Dental in the Oconomowoc Halloween parade. Seeing The Foreigner at the Milwaukee Rep (you gotta go!). 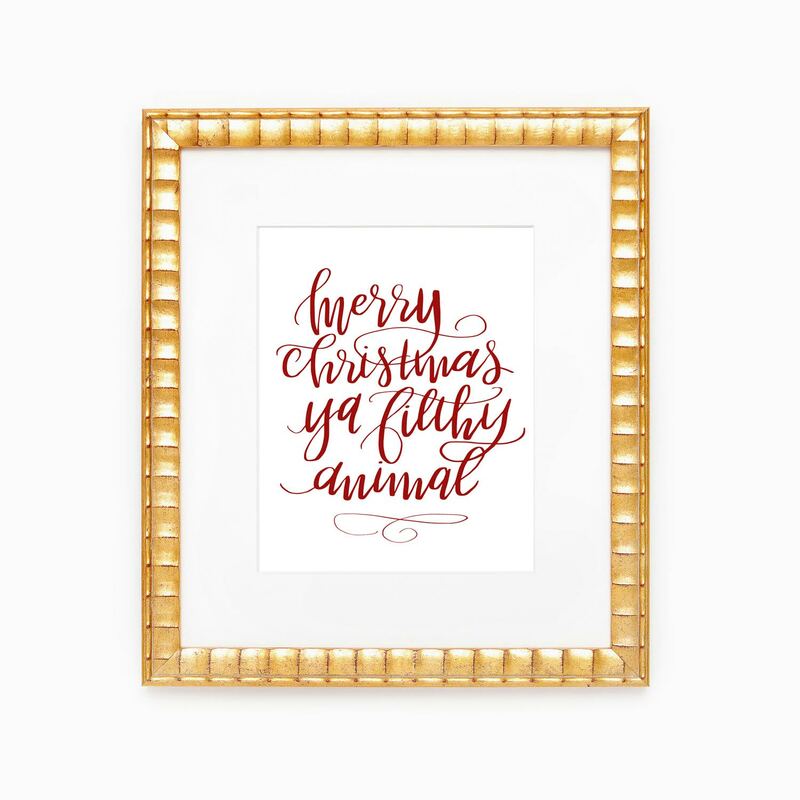 Sharing some hilarious Etsy cards. Day tripping to Cedarburg & eating at Farmstead. Making creamy chicken & mushroom soup. Visiting a little French country store in Waukesha.